"The wok is most often used for stir frying, but can also be used many other ways, such as in steaming, deep frying, braising, stewing, smoking, or making soup. 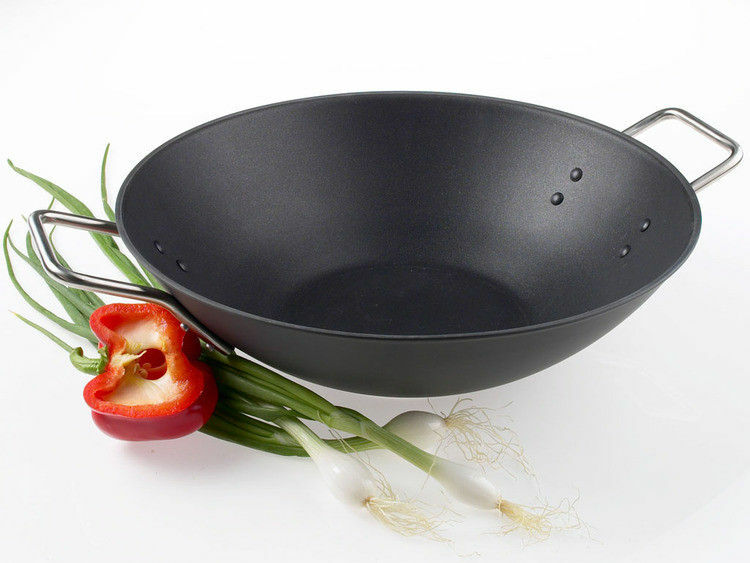 The main advantage of wok beyond its constructed material is its curved concave shape. The shape produces a small, hot area at the bottom which allows some of the food to be seared by intense heat while using relatively little fuel. Curved sides also allows a person to cook without having to ""chase the food around the pan"" since bite-sized or finely chopped stir-fry ingredients usually tumble back to the center of the wok when agitated. The curve also provides a larger usable cooking surface versus western-styled pots and pans, which typically have vertical edges. This allows large pieces of food seared at the bottom of the wok to be pushed up the gently sloped sides to continue cooking at a slower rate. While this occurs another ingredient for the same dish needing high heat is being cooked at the bottom. The pointed bottom also allows even small amounts of oil to pool. As such large food items can be shallow fried, while finely chopped garlic, hot peppers, green onions, and ginger."